The Becker story for 1981-1984 particularly depends on archival material, especially BeckerBriefs (available however, only through June, 1981), and remembrances of various key employees. As noted, the author was on sabbatical during a good part of fiscal 1981, until late summer of that year. During this period, his personal knowledge of developments within the firm was limited. The author remembers coming to New York from Nantucket perhaps in November, 1980, after Jack Wing's dismissal, to discuss the organizational situation with old colleagues. This meeting took place shortly after Wender's late October establishment of the OCE and Policy Committee, as earlier reported. The general consensus was that (1) top management and supervisory level morale was deteriorating; (2) Ira was asserting his authority in ways not heretofore seen - and unfortunately unfavorably, without an in-depth understanding of various parts of the business, and without an appreciation of the unintended consequences of his moves and style; and (3) he was oriented to bringing in more managers with "industrial management" experience but without any securities operations experience (there were growing issues with Kane and Hilton). There was some thought that Ira was "pumped up" by the firm's good results in 1980 (discussed earlier) and, if so, he was unwisely and inappropriately "feeling his oats." The general feeling was that something or somebody had triggered Ira to be more aggressive in his management role, and that, as in the case of the Wing termination, Ira was operating with the direct and specific support of W-P for his actions, and particularly from Warburg. The discussion adjourned on the subdued note that any concerted effort to resist Ira would not likely be successful, and might be even more harmful to the business. Everyone should perhaps do his or her best to adapt to and try to smooth out the CEO's new aggressive style. Barry Friedberg was appointed Executive Vice President of WPB and member of the top Operating Committee. The firm's research, execution, and positioning services to institutional investors remained highly regarded and rewarded with business. New York Times quotes of Don Trott (Manager) and of various analysts were appearing regularly and favorably. The funds evaluation services were growing steadily with continued high regard, now under Al Pisterzi’s leadership. John G. Heimann joined AGB-WPB in a senior management capacity in July. Ray Holland resigned to join Neuberger Berman. WPB assisted Citicorp Ventures in privately financing Westair, a small commuter airline located in Burlingame, CA. A Paris office was opened, with an eye to further expansion of the firm's international business in U.S. securities, and of the commodities business, especially dovetailing with the new Buenos Aires office. One of the most significant developments affecting AGB-WPB during 1981 was the nationalization of Paribas and related developments. With the election of Mitterand in France in May, 1981, the possibility of the nationalization of various industrial enterprises and the larger private banks, including Paribas, became a reality. The New York Times, in its September 3, 1981 issue - following a period of rumor and political rhetoric beginning earlier in the year - reported that Pierre Moussa, Chairman of Paribas (". . . one of France's most dynamic investment banks . . .") was leading a campaign to exempt Paribas from nationalization. He was proposing that banks like Paribas be permitted to set up an international operation exempt from nationalization, pointing out that the various non-French institutions with which Paribas was affiliated had warned they would seek to end the Paribas connection if it were nationalized. Ira Wender, head of A.G. Becker, was quoted in saying "We would feel very uncomfortable with a French Government-owned shareholder and would seek to end the relationship as quickly as possible"
Nonetheless, the nationalization plan was approved by the French government a few weeks later. In mid-October, the New York Times newspaper reported a plan for a consortium of investors to purchase from Paribas a controlling portion (60%) of the shares of its wholly owned subsidiary in Switzerland - Paribas Suisse - for some $414 million. The proposed investor was Pargesa Holding S. A., which group reportedly included Power Corp. of Canada, Etablissements Frere Bourgeois (Belgium), Volvo Finance S. A., and A.G. Becker & Co. However, within days, the French government announced that it would stop this transaction, with which action Paribas apparently also agreed. It is not clear what, if any, position Warburg took regarding all these matters. The Pargesa transaction apparently was, in fact, completed, despite the uproar, since many years later, when Paribas was re-privatized, it bought back its former Swiss subsidiary. It is not clear whether Becker continued to be an owner of Pargesa or perhaps dropped out as an investor. On October 22, when the French National Assembly voted to nationalize Paribas, Pierre Moussa resigned as Chairman. Later, the French government announced it would sue Paribas and some of its executives (including Moussa) for violating France's exchange control laws in connection with Paribas' sale of the its Swiss and Belgian subsidiaries, and assisting clients in transferring currency assets to Switzerland. Later, Moussa and colleagues were entirely acquitted of all charges. The final takeover bill was not signed until about Feb. 12, 1982, at which time Jean-Yves Haberer, 49, a senior civil servant in the government's Finance Ministry, was appointed President of Compagnie Financiere de Paris et des Pays-Bas, succeeding Pierre Moussa. Between June and September of 1981, as the author completed his sabbatical, he had discussions with Jack Donahue. Dan Good, Fred Moss, and Bill Cockrum about how the business was progressing. Nobody was very optimistic, either about market conditions, and more broadly, about organizational spirit. Kane and Hilton were continuing to have an ill effect in central management; it was embarrassing how little they knew about the areas and tasks for which they were given responsibility. The author was concerned about the firm losing additional key people - such as Donahue, Moss, and Kopin. With so many of them gone there would be a good chance that the business would spin out of control, especially given now the significance of principal dealing and asset trading. These activities were increasingly risky, and yet were central to Becker's business, and needed to be pursued if profit was to be made. But discipline, staying within limits, and applying years of judgment and experience, were essential. The author had extensive written and some face-to-face communication -in late June through October - with Wender, Scholey, and Haas, including taking a special visit to London in September. As mentioned to Scholey, discussions with Wender were to no avail - it was as if he couldn't consider any alternatives to the approaches he was taking. Scholey took the view that the author's discussions with various associates were undermining Ira's leadership and leading to obstructive rather than cooperative behavior by them. Scholey also took the view that the author was biased, it being well established that he was at the outset not in favor of Ira's election as President. The author remembers pointing out to Scholey that although initially not in favor of Ira's selection, the author thought for a period - pretty much through 1978 and 1979 and into 1980 - that he had miscalculated Ira's leadership abilities. Ira appeared to be working with the management team in an effective way. But then, much to the author's dismay, something happened (as if from an external party) in mid- to late-1980, and Ira began to pay little or no attention to colleagues who had long experience and discipline in the business. He insisted on placing staff persons between himself and experienced managers, and reduced and/or clouded their authority, in such a way that "his true colors" were unfortunately emerging, and many managers were considering alternative employment opportunities. All efforts to reverse the course of enthusiasm and support for Ira by the W-P interests - and by a few long time Becker associates - were to no avail. The author told Scholey and Haas that unless there was a reversal, the author would resign. It was clear that Scholey and Haas welcomed that decision, and the author's resignation was submitted effective the end of October, 1981, on which day Wender circulated a memo to the organization reporting the resignation. Managed or co-managed public offerings on behalf of: BIW Cable Systems, Inc.; Bonray Drilling Corporation; C-Cor Electronics, Inc.; Citicorp; Computer Devices, Inc.; Empire Incorporated; H&H Oil Tool Co., Inc.; Hawaiian Telephone Company; Indiana Bell Telephone Company, Incorporated; New Brunswick Scientific Co., Inc.; Sooner Federal Savings and Loan Association; and Hotel Investors. Mortgage-backed securities were offered on behalf of Federal National Mortgage Association (FNMA) and Verex MBS Funding Corporation. Rail equipment financing was provided to Burlington Northern Inc. Private placement services were provided to Cablevision Industries, Inc.; Clark Equipment Credit Corporation; Equico Lessors, Inc.; GATX Leasing Corporation; Gearhart Industries, Inc.; General Hydrocarbons, Inc.; Great National Corporation; National Car Rental System, Inc.; Natomas Energy Company; Peoples Cable Company; Weyerhauser Real Estate Company; and Weyerhauser Mortgage Company. Business consolidation services rendered in connection with the following transactions: the sale by IOT Corporation of Interstate and Ocean Transport Company to Southern Natural Resources, Inc.; the sale by International Paper Company of its subsidiary International Paper Credit Corp. to the E.F. Hutton Group, Inc.; the Laird Group Limited’s acquisition of Almac Plastics, Inc. and of Amesbury Industries, Inc.; the sale by AM International of AM Addressograph to DBS, Inc., and certain other operations to United States Banknote Corporation; Avery International’s acquisition of G. J. Aigner Company. ; the sale of Uno-Tex Petroleum Corporation, an indirect subsidiary of Allied Corporation, to Husky Oil Ltd.; the sale of Union Texas of Canada, Ltd, also an indirect subsidiary of Allied, to Drummond Petroleum Ltd.; the acquisition of A.J. Armstong Co., Inc. by Security Pacific Corporation; the acquisition of Comax Telcom Corporation by Prime Cable Corp.; the sale of a minority interest in Comdial Corporation to Telephone Utilities, Inc.; Oak Communication's acquisition of Davis Cablevision Corporation; a transfer by Dillingham Corporation of certain properties to Ala Moana Hawaii Properties; dealer-manager services to Dillingham; the acquisition of Giant Food Stores, Inc. by Ahold; the sale by Gould, Inc of a subsidiary to Parker Hannifin Corporation; the acquisition by Hanson Trust Limited of McDonough Co.; the acquisition (acting as Dealer Manager) by Natomas Company of a 75% interest in Magma Power Company; Home Federal Savings and Loan Association of San Diego’s acquisition of the mortgage servicing portfolio of a subsidiary of Skokie Federal Savings and Loan Association; Sun Company’s acquisition of Becton, Dickinson and Company; the sale by Sun Company of its Suntide Refinery to Koch Industries, Inc.; the acquisition of 51% of the common stock, and an option to purchase the balance, of Neiman-Reed Lumber and Supply Co., Incorporated, by UBM Group Limited; and the acquisition by Imperial Savings and Loan Association of the savings and loan subsidiary of U.S.Life Corporation. Special, customized financial services were provided as follows: the sale of Industrial Development Revenue Bonds of AmeriGas, Inc., and of the Beloit Corporation; private share issuance by Biogen N.V.; financing by Cable Television Company of Greater San Juan, Inc., and Cablevision of Chicago; ship financing for Equity Carriers I, Ltd.; nuclear fuel financing for Illinois Power Company and Pacific Gas and Electric Company; acting as exclusive agent for the John D. and Katherine T. MacArthur Foundation in the divestiture of Bankers Life and Casualty Company; special project financing for Pacific Gas Transmission Company, for Phoenix Seadrill/81 Inc.; and special financing of a Natomas/American President Lines Project. U.S.Government Guaranteed Ship Financing Bonds were sold for the benefit of a subsidiary of American Trading Transportation Company, Inc.; Chrysler Corporation; D.F. Levy Marine Limited I; M.L Barge Pool III Partners and VII Partners; Ogden Corporation; and Crowley Maritime Corporation -- all under the expert oversight of Bill Pope. Unfortunately, the archives do not contain an annual report or an audited financial statements for FYE October 31, 1981. In January, 1982, A.G. Becker Inc. published a brief, 7"x 8 1/2", foldout audited Statement of Financial Condition as of October 31, 1981 (completed by Arthur Andersen & Co. on December 21, 1981) which statement showed footings of $5.2 billion and stockholders' equity of $83.5 million, as of FYE 1981. The equity account included retained earnings of $34,307 thousand. In the Offering Statement for Employees issued in January, 1981, the financial statement for AGB as of October 31, 1980, showed stockholders' equity of $72.4 million including retained earnings of $39,195 thousand. These appear to be comparable financial statements, and if so, they suggest a loss just short of $5 million for Fiscal 1981. Such unfavorable results would square with Scholey's comment to me in late September, 1981, referring to the "highly unsatisfactory results of the firm" for 1981. At the same time, the New York Times and the Chicago Tribune, looking back from August, 1982, reported that for the Fiscal Year Ended October 31, 1981, the firm had revenues of $250 million on which it earned $4-6 million; the results for Fiscal 1981 are not clear. Even with an apparent operating loss during F1981, net asset value per share increased from $26.79 to $28.28 which might be due in part to a change in the year-to-year valuation of investment securities. During the fiscal year 1982, from November 1, 1981 through October 31, 1982, a number of dramatic changes took place in A.G. Becker and Warburg Paribas Becker. As took place in early 1981, there may have been an annual offer to Becker employees in January 1982, to purchase common shares of Group (or Units in Holdings) as of October 31, 1981, but the archives do not mention any such offer. By the start of 1982 the nationalization of Paribas was well along, as above noted. In February, 1982, Jean-Yves Haberer, 49, the senior civil servant in the government's Finance Ministry who became Chairman of Paribas, joined the Boards of AGB and WPB. Herve Pinet became Haberer's most active Paribas associate in terms of AGB-WPB relationships. It is not clear when the cross-investment interests between Warburg and Paribas began to be undone, but presumably that process took place in early- to mid-1982. In connection with these discussions and/or transactions, the relationship of the European partners to AGB-WPB undoubtedly must have been discussed. As was an annual practice, AGB and WPB held a management conference in February or March, 1982, which on this occasion was at a Florida resort. Some 50 senior managers of the combined firm attended. Plans and arrangements for the conference reportedly were made primarily by Kane and Hilton, under Ira's direction. Ira was scheduled to lay out a vision and plan for the firm in an opening, keynote speech, but for personal reasons, apparently mental and emotional, he was unable to deliver his speech. He left the podium in embarrassing silence. The conference broke up early and on a very uncertain tone. Reportedly, everyone at the conference, including representatives from Warburg and Paribas, were mystified. After this conference, Jack Donahue and Fred Moss resigned. Fred retired for a while, joining the Moseley firm in Boston later in the year. Jack joined Oppenheimer for a short period, and then went to Prudential Securities. With Jack's departure, Tom York, Executive Vice President, joined by Bill Leddy, took over the leadership of Credit Securities. Ken Nelson, the head of firm-wide order handling, also resigned at this juncture. In late July, both the New York Times and the Chicago Tribune reported that Becker was "in trouble" on two counts. One, Becker had losses in trading Cities Service Options. Secondly, the firm had large losses in trading shorter term treasury securities; some government dealers were trading with Becker only on a cash basis. Overall, rumor had it that these continuing short term losses led to Becker's having a large cumulative loss for its first eight months, through April 20. Bill Kane was interviewed with respect to the Cities Service Options losses. He confirmed that a number of Becker's options trading clients had losses but no dealer was in a deficit position and the losses did not affect Becker. Secondly, Wender told the Dow Jones News Service that Becker had experienced a $2 million loss for its first eight months stemming from the firm's brokerage business, not from government bond nor options trading. Ira went on to report that some 250 employees had been laid off and this may have contributed to the false rumors. He said that revenues for the eight months were $170 million and were pretty much the same as for the same period of the prior year in which period Becker earned about $6 million. A rumor promptly appeared in the newspapers that Becker actually had a $9-10 million operating loss (vs. a $2 million loss) for eight months - that the $9-10 million loss was reduced by a one-time accounting credit entry of some $7 million due to the recovery of the excess funding of the firm's pension plan. Ira's press release purportedly was the "last straw" for his European support group, particularly, it was reported, for Warburg, and more specifically, for Sir Siegmund himself. An AGB-WPB Board meeting was coming up shortly and at that meeting on July 9, Wender submitted his resignation. Approximately on the same date, Warburg and Paribas agreed to "take control" of Becker by exercising their right to purchase just over 50% of the firm's shares. There are no records of this transaction in the archives but according to the newspaper reports the transaction involved W-P investing $50 million in the purchase of shares, either from the company or by tender to employee shareholders. In connection with the resignation of Wender as President and CEO of AGB-WPB, John Heimann and Dan Good were elected Co-Chairmen. Presumably Dan was to emphasize internal operational management, leadership, and morale restoration. Heimann was to be spokesman and advisor and WPB new business developer. The new team put in some special retention bonuses and selected stock options to settle down and retain key people. Shortly, Bill Kane and Mike Hilton were terminated, and Ray Holland and Ken Nelson were recruited back to the firm. Unfortunately, Bob Karlblom left for the Chicago office of Lehman. The firm-wide computer systems review and replacement program pushed by Wender and overseen by Bob Franze, formerly of Arthur Andersen, with a cumulative cost of several million of dollars, was abandoned. The archives report very little about this project or the fate of Franze. During the period after Wender's resignation until fiscal year end, Dan Good and Peter Darling (Warburg) explored a possible combination of AGB-WPB with Donaldson Lufkin, which discussions rather quickly ended without any action. Toward the end of business on Friday afternoon, October 8, 1982, (Columbus Day weekend), Randy Harris, Becker's General Counsel and then officing in New York, received a call from the Chicago office of the Securities & Exchange Commission. The message in effect was that, by the SEC's analysis, A.G. Becker had a regulatory capital deficit of some $80 million. Further, this shortage needed to be corrected by the opening of business on the following Tuesday morning if Becker wished to do business on that day and forward. Randy proceeded to Martha's Vineyard for his family weekend vacation, but arranged for a Sunday transatlantic conference call with himself, Scholey, Good, Heimann, and Kopin. It would be resolved later whether or not the SEC's or AGB's calculations were correct. In the meanwhile, Warburg on Monday transferred some $85 million to AGB-WPB and the funds were put in form that met the SEC requirements. Becker opened for business on Tuesday per normal. This "Columbus Day surprise" in part provided the stimulus for a further assessment by Warburg and Paribas as to their joint investment in AGB-WBP and led, as described later, to the purchase of Warburg's interest by Paribas. To finish off the tumultuous year, Sir Siegmund Warburg took ill in early October and died in London on Friday, October 15, 1982. Upon Sir Siegmund's death, David Scholey was elected Chairman of Warburg. As noted earlier, the unwinding of the cross investment between Warburg and Paribas was by this time probably already completed leaving only to be sorted out the joint interest in AGB-WPB. Also in late 1982, Al Kopin resigned due to personal health reasons. The completion of over two dozen assignments as financial advisor and/or negotiator/agent in a business consolidation transactions involving and serving a wide range of industrial, commercial, and financial organizations including Coca-Cola Export, Sun Company, Elf Aquitaine, British Oxygen, First Pennsylvania, and First Chicago Corporation. Some ten initial public offerings of growth companies. A number of nuclear fuel trust financings involving major utility sponsors such as Northeast Utilities, Public Service Company of Indiana, and Pennsylvania Power & Light. The underwriting and distribution of a wide range of industrial revenue, pollution control, assisted living, or residential housing revenue bonds. Underwriting and distributing a number of U.S. Government Guaranteed Ship Financing Bond issues. Completing share conversion programs, short term and longer term financings, and business consolidation transactions involving a wide range of savings and loan associations. Divising special structures and programs for access to the U.S. money markets by a number of foreign industrial and banking companies, including Mannesman, Banco Nazionale del Lavoro, Bayerische Landesbank, Mitsui, Credit National, Nord/LB, Dai-Ichi Kangyo, and Fuji. Completing a wide range of corporate finance services for organizations in the cable TV and related communications fields. In December, 1982, Arthur Andersen presumably completed and presented its audit for the FYE October 31, 1982, although there is no copy of this report in the archives. However, the audited operating results for Fiscal 1982 are available in the F1983 audit. From this report we can determine that revenues for Fiscal 1982 were $282 million, resulting in an operating loss of $9.6 million, offset by a one time income tax benefit of $9.1 million. This left a small net loss of $552 thousand, plus a loss from discontinued operations of $212 thousand, resulting in a total loss of $764 thousand. This is before the credit due to the windup and replacement of the firm's over funded pension fund. That credit, after taxes, was $6.7 million, and thus the firm's accounts showed a total net income of $5.9 million for the year. In the meantime, consolidated footings had crept up further from $5.2 billion to just over $6 billion. As noted earlier, experiencing an operating loss of some $9.6 million, possibly following on a loss in the prior year, while at the same time observing and sensing wide ranging management and organizational unrest, in part involving the questionable and unstable leadership of a long time highly regarded counselor, along with increased leverage, was being taken quite seriously by Warburg. There is in the archives no record of the Group's net asset value per share for October 31, 1982. It is believed to have been approximately $30.00, vs. $28.28 a year earlier. Certainly by early calendar 1983, Warburg and Paribas were discussing which organization would become the single investor in AGB-WPB. It will be remembered that Paribas was now nationalized under the leadership of Jean-Yves Haberer, who, along with Herve Pinet, had visions of expanding Paribas' presence in the United States. Paribas had a governmental mandate to pursue strategic international expansion. On the other hand, Warburg had recently lost the behind-the-scenes direction of Sir Siegmund. Scholey, supported by Grunfeld, would still be smarting from the management turmoil, poor results, questionable controls of AGB-WPB, and disappointing performance of a long time U.S. counselor in his management role. In addition, by this time, Scholey was harboring visions for Warburg in the United States that did not involve Becker. Thus, it would appear that it was easy to reach a deal in principal - Warburg would sell their interest to Paribas. The only question was on what basis? The American management was not privy to the discussions between the European partners and there are no documents in the archives which provide any information about the Warburg-Paribas transaction. However, it is interesting and informative that, in the book "High Financier: The Lives and Time of Siegmund Warburg," Niall Ferguson, the author, reports that Warburg received $33 million from Paribas for its interest in AGB-WPB (p. 391). The trade date was April 8, 1983. The author will leave it to an astute reader/analyst to calculate whether Warburg realized a profit or loss, and in what amount, on its investment in Becker. In connection with Paribas taking over control of AGB-WPB on April, 8, 1983, the name of Warburg-Paribas Inc. was changed to Paribas Corporation, owned entirely by Paribas interests. The name of the top "Group" company was changed to A.G. Becker Paribas Group Incorporated, and the name of the intermediate holding company to A.G. Becker Paribas Holdings Incorporated. Given the now single majority owner, the two operating companies were merged into one and renamed A.G. Becker Paribas, Inc. The top Group company was majority owned by Paribas Corporation (about 61%); employee shareholders and their profit sharing plans owned the balance (39%). (The percentage interest of Paribas in the Group is quoted somewhat differently in different documents in the archives. For purposes of this Chronicle the above figures are acceptable). Given Paribas' majority ownership of the Group, Paribas, through Board procedures, elected Herve Pinet as Chairman and Chief Executive Officer, John Heimann as Deputy Chairman, and Dan Good as President and Chief Operating Officer of A.G. Becker Paribas ("AGBP"), the sole operating subsidiary. John Heimann was also appointed an officer in Paribas International in Paris. Pinet, Heiman, and Good made up the Executive Committee of AGBP, and Heimann and Good were co-chairmen of the management committee. According to the New York Times, in June, AGBP was off to a good start with "healthy profits for the year to date." Herve Pinet was now living in New York, where Dan Good had moved earlier. In early June, AGBP announced the formation of Becker Ventures Associates, a general investment partnership, with $21 million in capital. BVA was to invest in "a broad spectrum of opportunities including technology, manufacturing, and consumer products." BVA had four general partners: Bill Cockrum, Dave Wicks . John Keefe, and Stuart Johnson, located in New York, Los Angeles, and Seattle. It is not clear what interest AGBP had in BVA and whether the partnership was profitable before its assets were sold in 1984 or 1985 to its leading investor. With the full majority ownership by Paribas, the new management team circulated an up-to-date fact sheet on Paribas. The fact sheet reported among other details that Paribas's total assets were $52 billion and net worth $2.4 billion. Within Paribas's assets was a portfolio of some $1.6 billion in commercial and industrial holdings in France (46%), outside France in Europe (26%), and the balance elsewhere in the world. John Wilson, who joined the firm earlier in the year, was now in charge of all Equity Related Activities. Wilson came from Lehman Brothers KL. Earlier, in January, John Levy, who formerly had these responsibilities, resigned to join Lehman Brothers KL. Burton Weiss came out of retirement to join Alan Le Clair in the development of an asset management business. It appears that Burt's work was carried out in London and the task was on behalf of Warburg Investment Management International. New hires were now Retail Sales Managers in the London, San Francisco, and Chicago offices. Leo Hindery joined AGBP as Chief Financial Officer in August. Barry Friedberg was appointed General Manager of Investment Banking. Randy Harris joined Ray Holland in the management of Dealer Services, Operations, and Exchange Floor activities. Steve Looney succeeded Randy as General Counsel. Ken Nelson (now back with the firm) became manager of Dealer Services Marketing. (Unfortunately, Ken in due course again resigned for health reasons, and shortly thereafter died). Tom York and Bill Leddy were assigned to evaluate hedging and arbitrage opportunities for all debt activities including syndicated offerings. Through new colleagues in the commodities business, the Clark Street Futures Fund was launched. CBS/Black Hawk Cable; First Chicago/Banker Trust credit card division; and (with Warburg) Oppenheimer/ Mercantile House - also, joint with Openheimer, AGBP represented Esmark in their successful hostile bid to acquire Norton Simon. Fixed income activities made a significant contribution to the firm's good first half results. A favorable market buoyed equity related activities. Selective recruiting expanded the equity sales force by 10%. Dealer service client prospects now included the brokerage activities of banks and thrift institutions. the Market Maker Clearance business was sold in May. (The Fiscal 1983 audit reports that this business was sold at a gain (net of an operating loss before sale) of $4.6 million). Mid-Continent Capital was sold to its management at book value. Discussions were underway for the sale of the funds performance evaluation business. All these moves were being adopted as part of a strategy to slim down the number of activities in which the firm participated and redeployed capital to areas of higher return. The report estimated that the activities being sold would reduce employment by about 500 people. The midyear memo went on to report that revenues for the first six months totaled $179 million, up $50 million over the first six months of fiscal 1982. Net asset value per share was up to approximately $32.57 as of April 30, 1983. On October 14, three months later, a follow-on quarterly report was circulated to employee shareholders. Operating result for nine months were summarized. Revenues for the nine months reached $249 million, up $57 million over the comparable period in Fiscal 1982. However, expenses, especially employee compensation, benefits, and accruals, were up substantially, leaving only marginal operating profits. On the personnel front, the report enthusiastically announced that Michael J. ("Jack") Kugler joined the firm as a Managing Director and General Manager of the Fixed Income Group. It was noted that Kugler came from Merrill Lynch where he was head of the Government Securities and Corporate Fixed Income Group. Becker's management hired Kugler despite serious questions about his risk-taking proclivities and his disregard of management oversight and trading limits. Per earlier mention, Leo Hindery joined as Chief Financial Officer, having had that role previously at Jefferies & Co. in Los Angeles. It was also announced in the circular that Paribas was willing to provide, if needed for growth, additional capital to the firm in the form of preferred stock or subordinated loans - forms of investment that would not dilute the interest of employee shareholders. In addition, the circular reported the establishment of an agreement with seven major money-center banks for a $127.5 million revolving credit facility under which borrowings would constitute good regulatory capital. Shortly after Kugler joined the business, Bill Leddy left to join Donahue at Prudential. In due course, Tom York went over to Security Pacific Securities for two years, and then to Bear Stearns until 1998 when he retired. A high level of private and public placement of debt obligations of financial asset organizations such as Equicor, Northwest Acceptance, First Chicago, Shawmut, and Marine. An extensive number of financial services provided to savings and loan associations. Financial advisory services to many old and new clients. A range of managed public revenue bond offerings on behalf of a burgeoning number of bonding authorities created as government agencies by many states, counties, and cities. A continuing number of IPOs and other common stock public offerings, including those providing funds to Park Electrochemical, Computer Devices, Stiffel Financial, Applied Circuit Technologies, and Reading Company. Additional nuclear fuel financing programs for sponsors including Middle South Utilities and NICOR. The announcement of financings during the year completed by various corporate finance and fixed income professionals within the Becker organization reflected the changing pattern of firm ownership. The announcement of most financings completed in the early part of the year carried the now-traditional moniker “Warburg Paribas Becker/A.G. Becker.” Within a few months, the moniker in tombstones announcing completed transactions changed to “A.G. Becker Paribas,” with “Incorporated” listed underneath in very small font. Toward the end of the year, this moniker was changed to “Becker Paribas” (with “Becker” over “Paribas,” all in bold letters), and underneath this setup, in small font, “A.G. Becker Paribas Incorporated.” Business was done at a hefty pace, notwithstanding these changes in organizational ownership and the symbols thereof. The competency and professionalism of the Becker personnel was the primary explanation for this uninterrupted flow of high quality investment banking services (attributes which Merrill Lynch later observed and valued, as will soon be reported). On December 30, 1983 the New York Times reported that Becker had agreed to pay $300,000 to settle (without admission or denial of guilt) administrative proceedings brought against it by the NYSE and SEC over the computation of net capital for several months in 1982. Some days before the newspaper report, Chairman Pinet circulated to all employees a statement to alert them to the prospective settlement and anticipated related news reports. Pinet pointed out that no customer was ever at risk, that there was an honest difference in the interpretation of the highly technical accounting rules, and that Becker's practices had been earlier reviewed with its auditors and with the NYSE. Nonetheless, it was not publicity that Becker Paribas welcomed. In December, Arthur Andersen completed its audit of financial statements for the FYE October 31, 1983. Revenues for the year reached $316 million including $2.6 million gains on the sale of assets (in connection with the disposition of the market maker clearance business). A net operating loss was experienced in the amount of $1.3 million (after a tax credit and including the non-recurring sale of assets). Effective at year end, AGBP sold the funds evaluation division and realized a one time net gain after taxes of $5.2 million. Some FES personnel joined the buyer; many went out on their own in a variety of financial roles. The firm's bottom line net income for the year was $4.2 million including some $8 million of non-recurring net income. The Group's stockholders' equity as of October 31, 1987 was $67 million. However, at the AGBP level, (by reason of the form of the Group's investment in its primary operating subsidiary), stockholders' equity was $165 million and capital funds were $186 million. Footings of the Group company (and thus total consolidated liabilities) shot up to some $8.2 billion, as of October 31, 1983 vs. $6 billion a year earlier. At the AGBP level, footings were $7.4 billion. (That's a lot of leverage!). The net asset value of the Group's common share for October 31, 1983 is not in the archives but the unaudited amount of July 31, 1983 was $31.15. It is the author's guess that by reason of the October 31, 1983 (fiscal year end) profit on the sale of the performance funds evaluation division the net asset value would have increased by, say 6-7%, and thus, let's estimate an increase to $33.25. Going into 1984, many of the events in the last half of 1983 were considered favorably by most employees: the resignation of Wender; the hiring of some top level managers with securities industry experience, and apparent competence, to replace earlier resigned key managers; the concentration of the European ownership and decision-making or influence into one institution with global activities; the rebound of revenues even in tough markets. On the other hand, the primary concern among some in top management was that Becker would now be developed rather singularly to suit the strategic goals of Paribas. The firm had become less diversified. Taking the Paribas growth path might mean substantial expense investment and low if any profits for some years. This argument, in its simplest and most crude terms, was that the Becker employee shareowners would then be financing the long term interests of the French government. There was also a basic concern as to whether any person from Paribas with relatively little experience in the knitty-gritty aspects of the U.S. securities business would provide the oversight and controls necessary to guide the business through the rough seas now engulfing it, and especially the fixed income business with record high interest rates and very choppy and uncertain markets. During the early months of 1984, some evidence of Paribas' expansionary enthusiasm was emerging. The New York Times reported that a number of traders were being hired at high compensation levels and expansion in bond trading was taking place in both New York and London. Also, internal rumors were circulating that high retention bonuses were being offered selectively, and front-end hiring bonuses were being liberally disbursed. Early in 1984, relations between Good and Pinet turned unfavorably and Dan decided to withdraw from the Board and management, return to the Chicago office, and concentrate on investment banking work. With Good's departure, Pinet organized a management committee to coordinate the operations of the business. The group included himself, Mannheim, Friedberg, Kugler, Harris, and Langlois-Meurine (international activities coordination). At about the same time, Charles Nathan, a well known New York "deal" lawyer, and Dorman Commons, a highly regarded West Coast corporate financial officer, left good employers to join Becker's expanding investment banking operations, respectively in New York and San Francisco. In March, the firm announced that it was selling its dealer services business to the Pershing Division of Donaldson Lufkin. This business accounted for about $40 million in revenues and had some 500 employees, 400 of whom would be going to Pershing. The reasons for sale were the same as for the 1983 sales - the redeployment of capital into more profitable uses. Ray Holland would go with the business and join Pershing. In early-to-mid March, Kugler and associates took on a large Treasury position with an immediate loss of some $20 million (which loss some remembered settled down within days to something like $5 million). But the effect on both Paribas and employee share owners was sudden. Employee share owners wondered if perhaps this again was evidence of Paribas' unfettered desire to expand at all costs, and with special risks. Paribas wondered if more control needed to be exercised over the positioning and risks being taken by its majority owned American securities business. Matters came to a head in early April in a discussion within the Executive Committee about the desirability of the purchase of the employee shares by Paribas. Discussions continued on into May concluding with a proposal from Paribas. On May 14, the Boards of AGBP Group and Holdings appointed an Employee Stockholders Committee composed of George Morris (Chairman), Bob Henkle, Paul Marcus, Don McKinnon and Don Messemer, to evaluate the proposal and report to the Boards. At the same time, the firm Houlihan, Lokey, Howard, and Zukin (“HLHZ”) was retained to opine to the Employee Shareholders' Committee as to the fairness of the proposal to the employee shareholders, and tax counsel was retained to opine on the tax effect to that group of shareholders. These various task groups reported to the Boards on May 25 with a unanimous recommendation to proceed. The proposed transaction was to be carried out in the form of a merger through which employee shareholders would receive a specified cash payment for each owned share of the Group and each unit of the Holding company. Subject to various conditions (all of which were ultimately met), the transaction was scheduled for closing on or about June 18. The terms of the "merger" were all laid out to employee shareholders in a brochure titled "Joint Information Statement and Merger Brochure" dated May 25, 1984. It is interesting to note that the Statement does not include any complete financial statements of the Group, Holdings, or the Operating company, as of any recent date. The statements were, however, available for inspection. The Statement did include a listing of capitalizations as of various dates from October 31, 1983 (for which there were audited statements), through April 30 ("estimated") and June 15, 1984 ("proforma") (the later date was the expected closing date of the employee share purchase). The Statement reported that the interim financial results of the Group and its subsidiaries for the six interim months (November through April) since the October 31, 1983 audit, were reviewed by the Employee Committee and HLHZ. It is the author's surmise that these interim statements for the six month period showed substantial losses, and a substantial reduction in the Group's net asset value per share to a level below the value agreed upon for the Paribas purchase of the employee shares, as next described. In summary, the amount to be paid to the Employee shareholders was determined to be $32.57 per Group share, and $27.58 per Holdings unit. This payment was reportedly the approximate per share valuation basis used in Paribas' purchase of the Warburg interests in 1983. Debt securities would be redeemed at their principal values, or if convertible, for the value of the underlying common shares. It may have been coincidental but the unaudited net asset value of the Group's shares about one year earlier, on April 30, 1983, was $32.57. It is a reasonable guess that this number was used by the Committee and HLHZ as a fair value for employee shares being purchased by Paribas by not taking into account losses since that date, essentially attributing them to Paribas's control and pursuit of its strategic objectives . The author is informed that the purchase by Paribas of the employees shares on the basis of the Warburg purchase was strongly pushed by both Barry Friedberg and Randy Harris. The Statement goes on to report that approximately $43 million was to be provided by Paribas to conclude the purchases of the various securities involved in the transaction. Newspaper reports on May 4, reported that with Paribas' additional investments Becker's capital would increase to $300 million. The same report quoted John Heimann as saying the firm currently had some 270 employee shareholders. The merger was to be effective on the date of the filing of the Certificate of Merger with the Secretary of the State of Delaware, expected to be on or about June 18, 1984. After the transaction, Becker was to continue to operate as before, with all officers and employees continuing in the same capacities, duties, titles (if any) and compensation being the same. With the change in ownership, the trade name of the operating subsidiary "A.G. Becker Paribas" was simplified and shortened to "Becker Paribas." Presumably Paribas took 100% legal control of the Becker Paribas Group on or about June 18. On April 11, 1984, it was announced that Shearson/American Express was purchasing Lehman Kuhn Loeb. At about the same time, it was announced that Pearson was taking a 10% interest in Lazard. In mid-April, shortly after the announcement of the Lehman KL purchase, it was reported that Becker hired some 20 senior persons from Lehman with aggregate front end bonuses of $12 million. By late May, however, New York Times articles were reporting cutbacks in employment on Wall Street. In the Times about May 31, John Heimann is quoted as reporting Becker Paribas to be cutting back about 10% across the Board (about 200 positions). Wall Street was once again showing its traditional "herky-jerky" management style. During April and well into May, there were regular press reports of underwriting losses in the underwriting and distribution of Treasury bonds. The Becker credit securities group, presumably now under the new management of Kugler, was quite often mentioned. For instance, the Becker purchase on April 4 of $600 million 12 3/8% Treasury bonds was headlined, “Becker converting the bonds to zero-coupon "Cougars. "” A Becker spokesman was quoted as saying, "Most of the securities were committed to investors before the auction," a practice in the bond business that could lead to heavy inventory losses if the customers changed their minds when the actual purchase was at hand, and the market now down substantially. Within the firm, it was rumored that securities in fact were transferred to customers with the understanding that they could be returned in a few days at cost (a practice very close to, if not involving, "parking," which was not a permissible practice). During this very volatile period, a $1 billion position in long term Treasuries could easily lose $50 million in value in a day or so, if not more. With respect to the May 19 auction of 30 year Treasuries, the press reported "Some dealers have large losses." In the meantime, for this first half of 1984, it was generally "business as usual" for the rest of the organization. Research analysts continued to be regularly quoted in the New York Times and Wall Street Journal, individual clients continued to be serviced by their registered representatives, institutional order handling, block positioning, and research delivery went on as usual. Investment banking activity under Barry Friedberg's leadership, and especially in the areas of specialization, continued to be active. On July 5, Randy Harris, formerly General Counsel and then manager of the Dealer Services Group, was appointed Chief Operating Officer of Becker Paribas. In this capacity he served under Herve Pinet, Chairman and CEO and John Heimann, Deputy Chairman. He is quoted as "looking forward to coordinating the work of the operating managers." It is not clear whether the "operating committee" continued to exist and function at this time. According to a NYT article in late August, a meeting was held on July 17 between Paribas representatives, including Chairman Haberer, and the Becker Paribas executive committee. In this meeting, as well as at other previous meetings, according to senior management recollections, the question was how Becker Paribas might be restructured to operate profitably on a sustained basis. During this meeting, Paribas reportedly announced that, given the continuing operating losses, it would, within a few weeks, either sell off pieces of Becker or the firm as a whole. There is a question in the record as to whether sometime just before the above meeting, or perhaps more broadly, just before the time of, and as a basis for, the decision by Paribas to sell Becker in part or in whole, there was a substantial loss in the fixed income group which precipitated Paribas' decision - a loss, say in the order of $75-100 million - which loss was entirely for Paribas' account now that it owned all the equity. If so, the loss probably took place in the weeks after the agreement to purchase employees' shares (on or about May 25), or after the closing (presumably June 18). The author has researched the archives and newspaper stories for this period for more specific evidence of such a large and sudden loss, and can find no evidence of such an event. Certainly, market conditions from early June to mid July, 1984, were quite conducive to such a loss if fixed income management took a major position in long term bonds hoping for major profit-- and instead ending up with a major loss. Later, after Kugler joined Drexel Burnham, he is quoted as saying "Because of the volatility, you can get killed if you take big positions." There is no evidence that in saying this Kugler was being remorseful, or that his statement had anything to do with his experience at Becker Paribas. However, as noted, there is no evidence in public reports, nor in the archives, that such a major loss took place, and further, at least one person in senior management at the time does not recollect any such major loss. It may be that the known loss of $5-20 million on the auction bid, as previously reviewed, along with the accumulation of steady monthly losses were together sufficient enough for Paribas to push exit button. Paribas retained Jim Wolfensohn to assist in the Becker Paribas sale process. As best as can be determined, Pinet reported in the above meeting that Paine Webber had already approached Paribas about the purchase of the Becker commercial paper business, and that, in fact, eight other firms had indicated an interest in that business over the past year. It must also have been discussed at this meeting that Becker's recent cumulative losses were just too much even for Paribas to swallow. Apparently Paine Webber came forth in the first few days of August with a proposal to purchase the Group for $50 million which was about one-half of the equity book value now entirely owned by Paribas. The proposal reportedly was a disappointment to Paribas whose goal was to sell its ownership interest for at least $100 million, the purported book value of its equity investment. A few days earlier Pinet had opened discussions with Merrill Lynch. Discussions and negotiations with both possible acquirers were carried on for some days culminating in final sessions with each party on Saturday, August 4, going on late into that evening. In a final review, Paribas was able to offer to each party the use of all or a part of a substantial loss carry forward, which became the basis for each party to increase its offer. Merrill ended up with an offer of $100 million in Merrill stock, whereas Paine Webber's final offer was somewhat higher, but presumably in PW shares. In each case the only organizational commitment was to take most of the commercial paper department employees, and some investment banking staff. There was no interest by either party in the retail brokerage and institutional brokerage business, nor operations, nor taking on equipment, office leases, or miscellaneous assets or commitments. As the Merrill Lynch proposal neared its final stage, the acquirer was concerned about receiving a minimum cadre of money market personnel, investment banking, and credit department personnel. A bonus plan was developed which rewarded employees receiving Merrill offers; if they accepted and joined Merrill, they would receive a specified minimum bonus in January. If such persons didn't accept the Merril offer, they would receive no bonus. For personnel who didn't receive an offer from Merrill, they would be considered for a lesser bonus in September. This bonus pool amounted to about $30 million. The distribution plan was adopted and worked out as a good retention device. Paine Webber did gain something out of its discussions with Paribas in that John Ward resigned from Becker and joined PW with the intent to develop a commercial paper business for that firm. The Merrill offer was accepted by Paribas and announced on Monday, August 6. An agreement of combination was promptly drafted and finalized on or about September 10. Presumably a closing took place promptly thereafter. Merrill issued some 3.15 million shares in the acquisition, worth $100 million on the offering date, of which 10%, or 315,000 shares (worth about $10 million), were set aside - in addition to the earlier described cash bonus plan - for retention bonuses to selected Becker personnel joining Merrill. In its final days of Becker Paribas, Merrill and Paribas agreed to have Merrill senior managers sit in and oversee the Becker Paribas fixed income group operation in the New York office to help assure the retention of key personnel and commercial paper clients. This move was very important to the intended retentions. The balance of the Becker Paribas organization was left to its own decisions. Some employees would chose to go his or her own way, searching for and finding employment suited to their experience, skills, contacts, and in the case of salespersons, their client relationships. Others who belonged to a group in some cases chose to stay together and negotiate a new affiliation as a group. A wide range of brokerage houses, sales departments, and operating divisions were the beneficiaries of the Becker Paribas demise. Paribas retained the Becker Paribas special trading unit and moved the operation in with other Paribas operations in New York. Presumably, Merrill acquired the Becker Paribas corporation in such a way as to be eligible to take into account the Becker tax losses at least for the most recent year. However, it may be assumed that Merrill wrapped up the affairs of and liquidated Becker Paribas under some kind of "make good" agreement perhaps retaining a few additional assets useful to Merrill. Harris, Pinet, Heimann, and Friedberg, all in due course, were employed by Merrill. Friedberg and Harris ultimately were promoted to senior management responsibilities and went on to have successful careers at Merrill. The ultimate fates of Heiman and Pinet are not known to the author. We have just concluded an acquisition agreement with Becker Paribas, one of the world’s most respected investment banking firms. The acquisition brings us a fresh infusion of talent, experience, and resources. The addition of Becker Paribas professionals will make us even stronger. We are merging two of the world’s top commercial paper dealers. Becker Paribas is a world leader in serving financial institutions. In all areas of institutional sales and trading, of corporate and public finance, this merger enhances our level of service across the board. 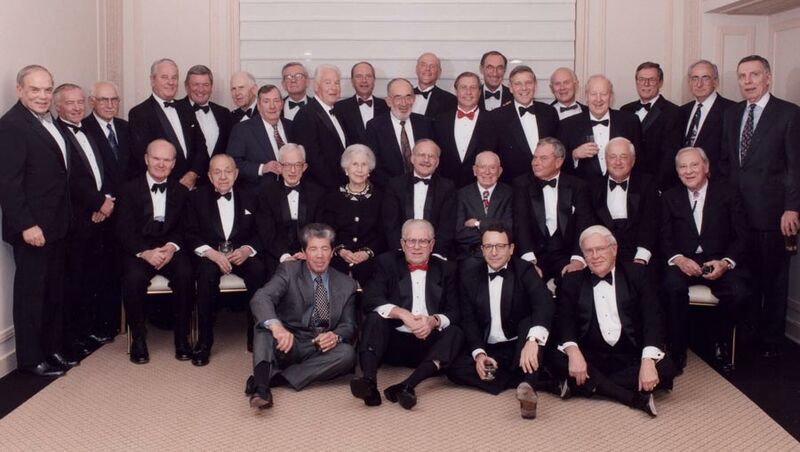 At the instigation of John Mabie and Roger Brown, a reunion of a number of Becker employees was held in Chicago on November 23, 1993, in memory of the Becker establishment in 1893. Some 50 former associates were invited and 32 were able to attend. Hortense Becker was the guest of honor and received special accolades. Speeches were made and memorabilia examined (all of which items are now at the Newberry). A photo of the attendees was taken. From about 1980 until 1994, and thus for some years before and after the termination of Becker, Roger Brown, Stan Wirt, and the author, as Trustees, continued the grant-making work of the James H. Becker Fund of the A.G. Becker Foundation. In 1994, the Trustees decided to turn over the Foundation’s funds to Thresholds, a leading mental health social service organization in Chicago. The objective of this move was to continue on the James H. Becker scholarship program within Threshold’s, assisting its members in their educational advancement needs. In 1994, some $483,000 was turned over to Thresholds and up through mid-2017, some $390,000 in tuition-assistance scholarships were granted to over 400 members of Thresholds, ranging from $500 to $5,000 per client. As noted earlier, the author has attempted to “chronicle” the history of A.G. Becker & Co. in objective terms. Occasionally, in the Becker story, an evaluative comment has slipped in, or an aspect of the story is told with an interpretive slant. I hope readers will excuse these diversions, and instead, turn to the Epilogue, in which section the author does review, reflect, and express opinions on the whole Becker saga, particularly the last 20 years of Becker's life, bringing out his and some colleague's thinking, tinged, or course, with all the advantages of hindsight. If you have commments and/or reflections about the Chronicle, or any aspect of the history of A.G. Becker & Co., Inc., please feel free to enter those thoughts in the Comments/Reflections Entry Form.and If you would like to read the comments/reflections left by others, please go to Published Comments/Reflections.